Sheri is an Emmy Award winning writer, producer, director. Over the years she has earned numerous awards for creative excellence. Since graduating from the University of Denver with a Mass Communications degree in 1982, she has been producing and directing hundreds of spots, television productions and an even award winning feature,”Moosie”. Tony Pfau and Sheri have collaborated on many projects over the years, including the feature film “Moosie”. Their most recent collaboration was on a project for Great West Life which earned a Herme’s Gold Award. Sheri also brings the marketing expertise, a keen business sense as bonus to the already cutting edge creative. She has a natural talent to work with and communicate to youth that will make Airpark a one of a kind production, be it television or other avenues we pursue to promote aviation to today’s budding aviators. 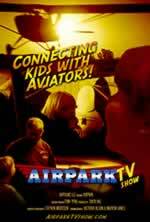 We are lucky and excited that she came on board to help make Airpark TV a reality.